Today the Gyalwang Karmapa’s Altruism Publications released a new book in its series, Philosophical Views: Beautiful Ornaments of the Dakpo Kagyu. This volume discusses the views of the Mind Only school and was created by the Committee for Composing Manuals for the Winter Debates, which is guided by the Gyalwang Karmapa. 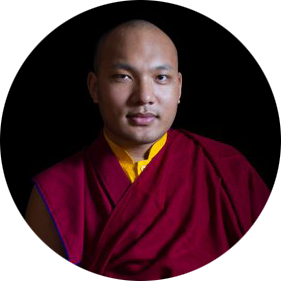 The Karmapa authored the introduction in which he first mentioned the three different names applied to the school, which are considered synonyms: Yogacarins (rnal ‘byor spyod pa, Yogic Practitioners), Vijnaptimatrins (rnam rig pa/tsam, followers of the Consciousness Only school), and Chittamatra (sems tsam pa, followers of the Mind Only school). The Middle Way school and the Mind Only school presented opposing views and their differences are sometimes described by saying that Nagarjuna, who composed the basic texts for the Middle Way system of tenets, represented the proponents of nonexistence, and Asanga, who wrote for the Mind Only system of tenets, represented the proponents of existence. Alternatively, it is said that the Middle Way teaches the nature (of mind) and the Mind Only teaches its dependently arisen manifestations. Turning to the system of the Mind Only tenets, the Karmapa listed the four that are key: all phenomena are mind only plus the eight consciousnesses, the three characteristics, and self-awareness. Among these, the most important is the first: all phenomena are merely mind. If we search for the source of all possible phenomena, we will find that the mind alone is their cause. This is the school’s main feature and the reason why the school is called Mind Only. Contrary to what many people think, the Karmapa noted, the assertion that phenomena are mind only was also present at the time of the eighteen original Buddhist schools. Found in a few of them, it developed gradually over a longer period of time. Three of the eighteen schools were important as the sources of the view that all phenomena are mind only: the Vatsiputriya (gnas ma bu pa), the Mahishaka (sa ston pa), and the Sautrantika (mdo sde pa). A lot could be said about the views of these schools; however in brief, the Vatsiputriya held the position of an ineffable or inexpressible self. The Mahishaka professed nine different types of uncompounded phenomena, among which was an aggregate that transcended the four conditions. The Sautrantika spoke of how the seeds or imprints were formed in consciousness and also posited a subtle mind that over a long time developed into the view of the alayavijnana, the all base consciousness. “We might have a doubt or a question,” the Karmapa added. “Between the era when the shravakas flourished and the era when the Mind Only school prospered, a long time passed. What happened during that period?” It is generally accepted that the fundamental division of the schools happened around 200 years after the Buddha passed away and gradually they separated in to eighteen different schools (some say there were more than eighteen). First they divided into the Theravadin and Mahasamghika schools, the Karmapa explained, and gradually into the eighteen, which all happened before the Christian era. Asanga and Vasubhandu, the main proponents of the Mind Only school, lived around the 4th century of the Christian era, so what was the situation during the hundreds of years between the them? The Karmapa replied that in this period, numerous mahayana sutras gradually appeared and spread widely in this world; mahayana tenet systems were elaborated; and great masters and scholars, such as Nagarjuna and Aryadeva, lived and taught. Another question follows: Nagarjuna and Aryadeva lived before the Mind Only school flourished during the time of Asanga and Vasubhandu. Why did Nagarjuna and Aryadeva not promote the Mind Only tenets? Did these great scholars simply did not pay attention to them? One could answer simply that of the two schools in the mahayana, the Middle Way and the Mind Only, Nagarjuna focused his activities on promulgating the tenets of the Middle Way school. If we comprehend the history and these reasons, this will give a basis to create an interest and a focus on spreading an understanding of the Mind Only school. It is usually said that Nagarjuna categorically refuted the positions of the eighteen different schools and did not present any of his own to prove. He simply negated and did not put forth his own view. However, in his commentary on the Prajna Paramita Sutra in One Hundred Thousand Lines, there are passages where Nagarjuna accepts some of the ways the eighteen schools establish their views and takes them as his own, so it is difficult to say that Nagarjuna only refuted others’ positions. One can say that mainly he refuted the sravaka schools and did not adopt very many of their views. Asanga and Vasubhandu related to the Mind Only school in a different way from Nagarjuna and Aryadeva. For example, in his Compendium of the Vehicles, Vasubandhu cited scriptures from the shravaka schools as a source for his positions and for his discussion of the alayavijnana, the ground or all-base consciousness. “However,” the Karmapa continued, “there remains the important question: What is the lineage of the Mind Only school that comes from Asanga? In his travel diaries, known as the Great Tang Records of the Western Region, Tang Xuanzang (Hsuan Tsang, fl. 602-664) relates that at night Master Asanga would go to Tushita Heaven and receive the teachings of the Five Dharmas from Maitreya and during the day, Asanga would come back to earth and teach them to people. There is something to consider here, since the Five Dharmas from Maitreya as they appear in the Chinese canon and those in the Tibetan lineages are slightly different. In the Chinese canon the Five Dharmas encompass the Yogacaryabhumi, the Sutralamkara, the Madhyantavibhanga, and the Commentary on the Diamond Cutter Sutra. In the Tibetan tradition, other texts are included such as the Abhisamayalankara and the Ratnagotravibanga, while texts in the Chinese list are left out, so some questions remain about this. In Chinese, the Karmapa related, there is an old life story of Vasubhandu and it differs from what Xuanzang writes in his travelogue. The older text relates that Asanga did go to Tushita to receive teachings from Maitreya but no one believed him, so Asanga invited Maitreya to the human world. Thus Maitreya came down from Tushita and taught the text known to Tibetans as the Five Bhumis, and presently in Chinese as the Yogacaryabhumi, (an old name for it was the Seventeen Bhumis). So the travelogue of Xuanzang and the old life story of Vasubhandu differ slightly, but do not really conflict. Returning to the question of lineage, the Karmapa asked: If one states that Asanga’s lineage comes from the protector Maitreya, the question that immediately follows is, Who is the protector Maitreya? Is he an actual historical figure or not? If not, then who is he? Historians do not usually accept gods as historical personages. We Tibetans assert that Maitreya is a deity. Who is he really? An historical person or a deity in Tushita Heaven? If we say that the Mind Only is a mahayana philosophical school, we need to say what the lineage is—that it came from the Buddha and it was passed down gradually from one teacher to the next. If we cannot say that, then it is difficult to say that this is a Buddhist school. We Tibetans are comfortable with saying the teachings came from the Buddha to Maitreya and then to Asanga, but following the ways of investigating used in our contemporary world, we need to look for a source. On the ultimate level, we can give this lineage without any intellectual discomfort, but on the relative level, there is a little unease. Usually it is said that the brothers Asanga and Vasubhandu were the originators or founders of the Mind Only school, especially Vasubhandu, and specifically his two texts, Twenty Verses on Mind Only and Thirty Verses on Mind Only. Of these two, it was the Thirty Verses that were the most important in presenting the tenets of the school, because it was the last text Vasubhandu wrote at the end of his life, though he did not have time to write an auto-commentary. In his life Vasubhandu had spent long years studying and practicing Mind Only texts and these Thirty Verses were the culmination of all his efforts. The reason and source for saying this comes from the travelogue of a seventh century Chinese translator, Yijing, who traveled over the ocean and came through Kalinga to study at Nalanda. He listed eight texts of the Mind Only school that scholars absolutely had to study, which resemble the Tibetan tradition: the Twenty Verses, the Thirty Verses, the Compendium of the Vehicles, the Compendium of the Abhidharma, Distinguishing the Middle from Extremes, the Treatise on Interdependence, the Ornament of the Sutras, and the Establishment of Activity (or Karma). In the India of that time, these were known as the Eight Treatises of Asanga, but actually quite a few of them were written by Vasubhandu, leading some scholars to say that the texts should be called the Eight Treatises of Vasubhandu, but it does not really matter. The primary disciple and holder of the lineage of Tang Xuanzang was a master called Kuiji (632-682), who wrote notes on the Great Treatise of the Mind Only. This text itself states that the sources it relied on were six sutras and eleven treatises, which include all of the eight treatises mentioned above with few added on. Among these eight, the Twenty Verses and the Thirty Verses were the most important; however, since the Thirty Verses present the positions of the Mind Only school and the Twenty Verses concern the refutation of its opponents, the Thirty Verses take precedence. The Great Treatise of the Mind Only was primarily based on Dharmapala’s commentary on the Thirty Verses plus those of nine other great Indian scholars related to the Mind Only, including Sthiramati and Dignaga. The treatise combined all these ten commentaries on the Thirty Verses into one, hence its name, the Great Treatise of the Mind Only. Completing his discussion of the source texts, the Karmapa turned to comparing views of the different schools. 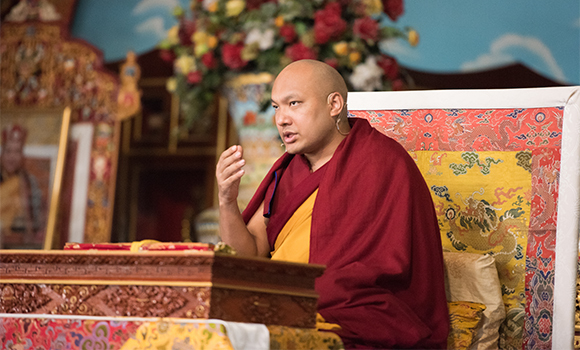 Time being short, the Karmapa said he would not be able to discuss two subschools of the Mind Only, the True and False Aspectarians, and he took up a very important section in the new book treating the distinctions between the False Aspectarians and the followers of the Buddha Nature or Tathagatagarbha school. This later school is found in China, and in Tibet the Madhyamaka Empty of Other School partially resembles it. We cannot say they are 100% the same but they are close, he commented. Some experts in Tibet, the Karmapa continued, state that the Madhyamaka Empty of Other School is the same as the False Aspectarian subschool of the Mind Only; however there are differences between the False Aspectarians and the Empty of Other school or the Buddha Nature school. According to Chinese experts, there are ten major differences between the False Aspectarians and the Buddha Nature Schools, and the Karmapa selected three of them. First, the Buddha Nature school asserts that everything compounded arises from thought, which the False Aspectarians do not accept. Secondly, the Buddha Nature school states that suchness is both the subject and the object, while the False Aspectarians state that suchness is emptiness. And thirdly, the Buddha Nature school accepts that among the three natures, the dependent nature is empty of itself, whereas the False Aspectarians claim that it is empty of what is other to it. Often people conflate the Buddha Nature school with the False Aspectarians, and the main reason is that many of the source texts for the two schools are the same: They both cite the Samdhinirmochana Sutra and the Lankavatara Sutra as well as the treatise of Asanga through Maitreya, Distinguishing the Middle from Extremes. However, even though the texts they cite may be the same, their way of explicating them is different, so the confusion stems from having the same text with two different commentaries and not distinguishing between these divergent approaches. As for the texts that the two schools did not share in common, there is one sutra and also the treatise known as the Supreme Continuum or as the Ratnagotravibhaga; however it is not clear yet who composed the text. Tibetans consider Maitreya to be the author and that the text was extracted from a stupa when light shined through a crack. This, however, presents a slight problem, as the text appeared in Chinese (albeit with the title of Ratnagotravibhaga, Distinguishing the Three Jewels) around the third and fourth centuries, thus before the time that Maitreya was thought to have taught it. Some say the author was Sthiramati (blo gros brtan po/blo brtan, cc 470-550), and according to Tibetans, Sthiramati’s teacher was Vasubhandu, but the Chinese tradition relates that Vasubandhu’s student Gunaprabha filled that role. In sum, it is difficult to say who wrote the text.